Trump says he and North Korean leader signed "a very good document" and have a good relationship. U.S. President Donald Trump said Friday following his summit with Kim Jong Un that he has "largely solved" the North Korean nuclear problem, AFP reported. Speaking to reporters outside the White House, Trump said his predecessor, Barack Obama, told him before he took office that the "most dangerous problem" for the United States was North Korea's nuclear weapons program. "I have solved that problem," Trump said. "Now we're getting it memorialized and all but that problem is largely solved." "We signed a very good document," he added. 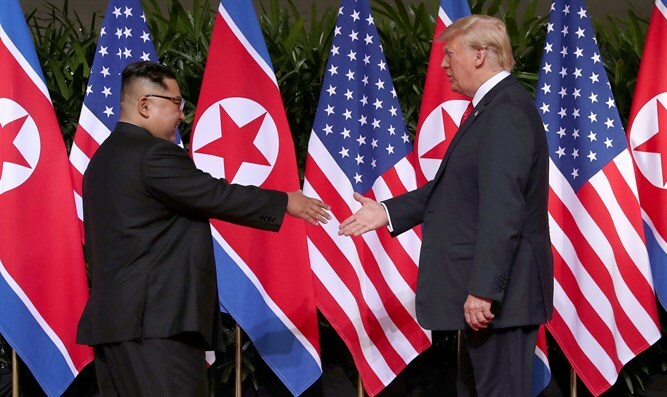 "But more importantly than the document, I have a good relationship with Kim Jong Un," he said, adding that they have "great chemistry together." "That's a very important thing," he said. "I can now call him. I gave him a very direct number. He can now call me if he has any difficulty. We have communication." "People are shocked," the president continued. "They thought Trump was going to get in, he's going to start throwing bombs all over the place. It's actually the opposite." During the summit this week, Trump and Kim reportedly invited each other to visit the United States and North Korea respectively, and both accepted the invitation. Following their 45-minute meeting on Tuesday, Trump and Kim sat down for a signing ceremony, putting their signatures to a document both sides described as “historic”, without revealing any details. After the signing, Trump held a press conference at which he said the agreement included a commitment to achieve total denuclearization of Korea, with promises to pursue “vigorous negotiations” to that end. On Friday, the President indicated there would be a "very strong verification process" for North Korean denuclearization. "We're well on our way to getting denuclearization, and the agreement says there will be total denuclearization," he said, according to AFP. Trump also defended his decision to halt joint military exercises with South Korea. "I said I'd like to halt it because it's bad to be negotiating and doing it," he continued. "I saved us a lot of money. That's a good thing for us."